If you have been reading this blog recently you can't have missed the posts on the FlueCube, a chimney cowl brought to my attention by one of my readers. I am always intrigued by new ideas so it was like a red rag to a bull and off I went to find out more about this cowl that could do something no other cowl has done before. While I love new ideas, experience has taught me that some 9 out of 10 brilliant inventions come to nothing in the end. I have written about more than a dozen or so such invention on this blog alone. So when I started to check out the FlueCube I got suspicious because the website has plenty of anecdotal material to support the assertions being made, but it is also lacking in any independent reviews or hard scientific facts. While I was critical of the fact that the claims were unsupported on the FlueCube website, I wrote to FlueCube and requested copies of any scientifically based independent reviews or test results, diagrams etc. What I got back is the following e-mail from the man himself Neville d'Herville. I print, unedited, it as I received it, interjected in italics with my replies / comments. "Sales figures and non-independent feedback are not great criteria by which to judge the scientific performance and effectiveness of any product - don't you think?" effectiveness? - um yes. Proves it works with the word spreading around doesn't it? Where do you get 'non-independent' from? All the testimonials on fluecube.com are independent. Customers can post negative feedback at anytime. Of course effectiveness in any product is essential Neville, but that effectiveness needs to be adequately and independently demonstrated. Additionally, many people, like myself, want to know the basic scientific principles of how a thing works. (1) does it form a vortex? 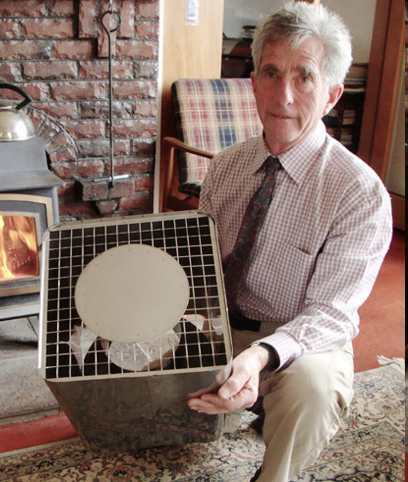 (3) how does the vortex add to the "vacuum" in the flue? (4) by what method/principle does it "self-clean"
I am not suggesting for one minute that you edit the feedback in any way but feedback would be far more effective if it were gathered by an independent source i.e an independent reviewer. Scientific performance? - who cares? The new world bank sponsored enviro-economic evangelists, maybe? What the heck is 'the scientific performance'. Define this. Wan't a power point display? Graphs? Figures? Mathematical symbols? A how to build it yourself guide? Who am I convincing? The masters? The demigods? Academic Alumni? The all seeing eye? I care about scientifically proved performance, like claims for fuel efficiency in a car for instance and I will not take the manufacturer's word on it. Independent tests or reviews is what I look for, and if you check the Internet you will see that there are testers who give trusted review in just about everything. On cameras for instance, you have Steve's Cameras etc. I only care for the people who those some of those people asume they can shaft. It's what oligarchy is. While they increase energy prices and remove cheap/ sustainable forms of energy from those already struggling, the technical progress is ironically made in light of their ridiculous economic models, foreign policies and public relations. I would tend to generally agree with this statement - government agencies are run by a bunch of overpaid monkeys who fiddle about with things they have little practical knowledge of, and generally they tend to make a complete arse of it. Institutions like the EPA don't produce science. They produce economic figures. That is because that is what it is all about. A New Zealand city gets hit with an earthquake. All the heat pumps fall off the walls, the power and gas is switched off - 50,000 people without heat and what does our government do? Give them free heatpumps. On Tuesday 14th June our masters at UNEP decide wood heaters need phasing out because soot is causing the ice to melt. I can think of certain things that need phasing out. In Ireland we have SEAI the Sustainable Energy Authority of Ireland and the EPA the Environment Protection Agency. Both of these agencies have made some very stupid moves and what sickens me is that the clowns making these decisions are on massive salaries. All of the above said Neville, I would love to see your cowl properly evaluated and a full and scientific review written by an independent capable individual. That way you could proceed to sell and promote your cowl, and probably see increased sales, without people like me asking awkward questions.